Imagine a clear blue sky with the sun shining bright and yellow. 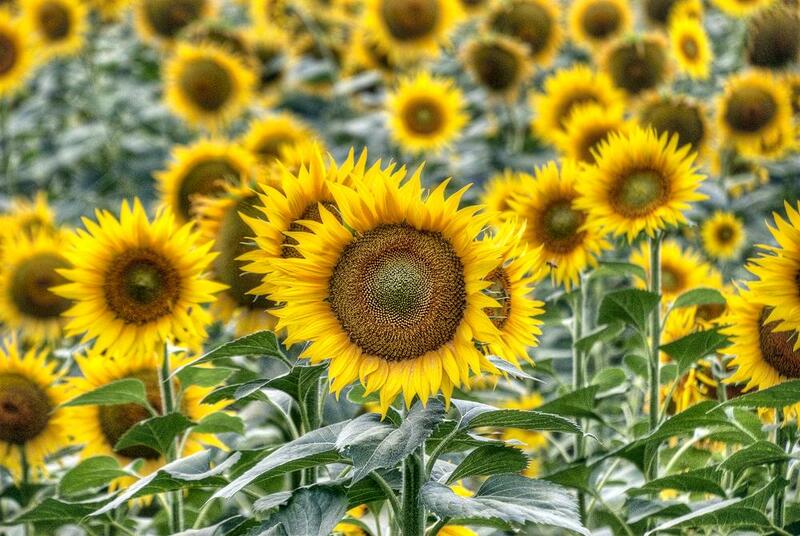 You see the love of your life standing at a distance, surrounded by a field of beautiful sunflowers. Music playing in the background as you start running towards each other. Sounds like the screenplay of a romantic movie? It doesn’t have to be. You can experience this yourself at Himawari no Sato (ひまわりの里), a vast floral garden with over a million sunflowers. It is located in Hokuryu-cho, a sleepy town in western Hokkaido dotted with sunflower and sunflower motifs. Himawari no Sato is a great place for a summer day trip from Sapporo, Asahikawa or Furano. Read along to know more about this fascinating world of more than million shining suns. Himawari no Sato is the largest sunflower garden in Japan. It was started in the year 1979, with an inspiration from the European sun flower fields. The flowers here bloom in the warm months of July and August. 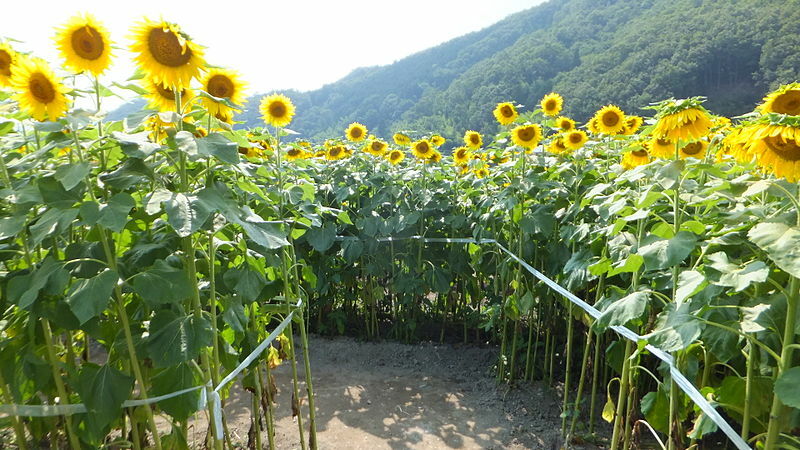 The sunflower field is 1.5 hour drive from Sapporo, and Furano and about 1 hour drive from Asahiyama zoo . I recommend reaching the field early in the day, when the morning sun makes the sunflowers shine at their full glory. Every year the garden holds a “Himawari Festival” (sunflower festival) from mid-July to mid-August. A number of events take place at this festival, including fireworks and awesome Taiko performances. See the below video, if you have never seen a Taiko performance before. 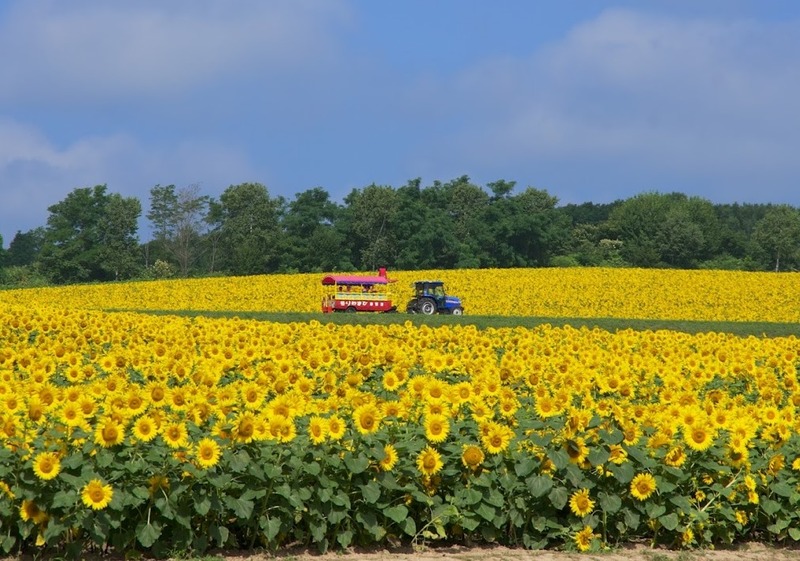 You can enjoy a ride around the field on the sunflower cart for a fee of 500 yen. 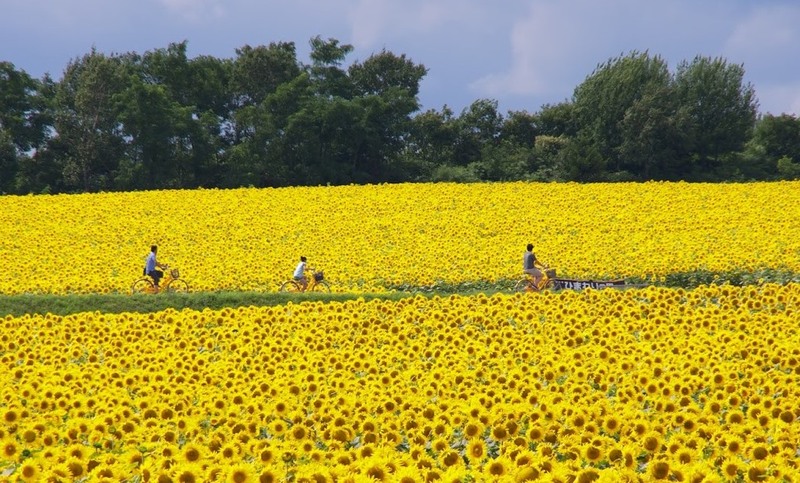 If you like to ride a bike, bikes are available for rent at 100 yen to experience the nature around the sunflower field. You can also feed dozens of ducks at the duck pond, for a fee of 100 yen. 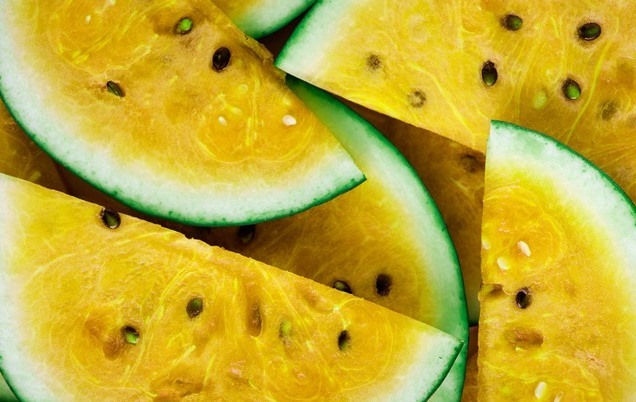 You can eat delicious sunflower ice-cream, yellow watermelons and other local delicacies. You can have fun by getting lost in the huge sunflower maze with your family or friend. Maze entrance fee for adults is 300 yen. You can also visit the Hokuryo onsen, which is only 1 km from Himawai no Sato. At this onsen, they use specially created sunflower products. Rental rooms for 2 hours are available for 1080 Yen. Hokuryo onsen entrance fee is 500 yen. There are a number of good restaurants and souvenir shops for you to eat and buy items. Opening hours: 8 am to 6 pm from mid-July to mid-August. Temporary baggage storage service is also available. If you are driving from Sapporo, then just follow the following route. Get on the Lilac Kamui line from JR Sapporo Station to Fukugawa Station towards Asahikawa. Catch a the bus to Hokuryu Cho, from bus stop in front of Fukagawa Hospital (深川市立病院). You will need to get off at the Hokuryu Kouko (北竜中学校前 ), which is the second last stop. The garden is only a short walk from here. For more information train and bus time tables and how to get Himawari no Sato by public transport, check this link which is in Japanese. Although Himawai no Sato opens every year from mid-July to mid-August, I suggest visiting the field from mid to late July, or early August. You will find the flowers to be at their full bloom around this time. Better yet check their website. I found the facility not very baby friendly. So, if you are traveling with young babies, you might need to think about feeding and diaper changes. The tracks were a bit narrow and difficult to push a baby pram. I recommend using a baby carrier for more freedom. Expect busy traffic during Obon holidays. We went to the field during the Obon holidays and our 1.5 hours’ drive from Sapporo, turned out to be 2.5 hours long. After visiting the sunflower garden, you can also enjoy the beauty and fragrance of thousands of roses at the Chippubetsu rose garden, which is a short drive from the sunflower field. Himawari no Sato, is truly a placed pulled straight out from romantic movies, which remains open only for a month. So, if you are in Hokkaido around mid-July to mid-August, then do make a trip to this garden. Do let me know if you have any favourite flower fields, or ask any questions or comments by writing below.